The Washington Free Beacon is sending intrepid firearms reporter Stephen Gutowski to cover SHOT Show, the firearms industry's trade show, from Jan. 21 to 24 along with video producer Zach Hanover. In addition to our usual written coverage of the newest, coolest, and most interesting firearms debuting at the show, trends in the industry, and craziest parties; we'll have live video interviews throughout the event broadcast across our social media accounts. We'll be producing video content to give you an inside look at SHOT Show's range day, convention floor, and exclusive conversations with people in the industry and in the gun-rights movement. Make sure you follow the Washington Free Beacon‘s IGTV channel on Instagram for in-depth video interviews with newsmakers, gun demos, and behind the scenes clips. Follow Stephen Gutowski's Twitter feed for quick hit interviews from gun companies and gun-rights activists. We'll also be doing Facebook Live events to give you guys an overview of what's happening at the show and answer some of your questions. Go ahead and follow the Free Beacon‘s Facebook while you're at it and make sure you're set to see our posts first so you'll get a notification when we go live. Our first Facebook live event will be on Monday morning from Range Day at noon EST/9am PST. You can also come back here for updates throughout the week for the latest on everything we're seeing and doing as well as when we're going live next. We'll continue to update this post with the latest from our reporters in the field at SHOT Show. And, of course, you can always follow official accounts on Facebook, Twitter, and Instagram for all of our latest stories and a wide range of interviews. Jan. 30: Here's Gutowski talking bump stocks with Adam Kraut, a firearms lawyer representing the Firearms Policy Coalition in a lawsuit against the Trump administration's bump stock ban. Jan. 29: Gutowski also interviewed Lara Smith of the Liberal Gun Club about a range of topics, including Oregon's attempts at extreme gun control legislation. Wednesday 4:33 p.m. PST: Gutowski's interview with Second Amendment Foundation's Alan Gottlieb is embedded below, and the article is here. In case you missed them, the Free Beacon‘s daily Instagram stories are on our Instagram page here. They give you a little bit of everything from the range, convention floor, and a related event. Wednesday 11:27 a.m. PST: Important news about Gutowski's first piece of convention swag. Wednesday 6:43 a.m. PST: Alan Gottlieb of the Second Amendment Foundation discusses a major Supreme Court case on gun rights that's being taken up. 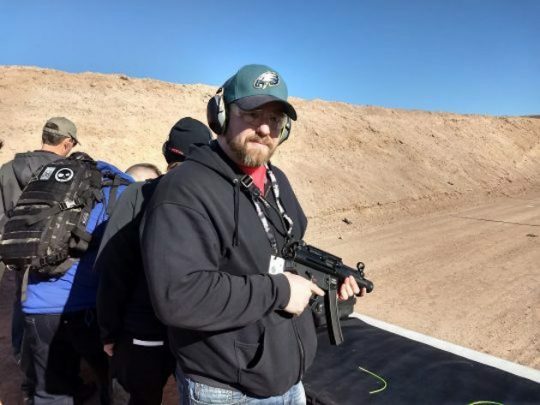 Tuesday 11:27 a.m. PST: The Free Beacon spent some time with firearms instructor and Second Amendment champion Rob Pincus, part of a larger talk to come later. Click the following links for interview previews with Dianna Muller of the DC Project and Cameron Chell, co-founder of BitRail.